Pianist Maria Asteriadou believes that classical music can reach us emotionally, powerfully, and directly, such that it can be deeply satisfying—whatever people’s walks of life. Her opinion may seem at odds with prevailing ideas about the art form. Asteriadou’s 18-year-old son, for example, argues that people today don’t want to think when they listen to music. They want to feel music’s rhythms, feel music in their bodies. To him, classical music seems overly structured, cerebral, and elitist, as Asteriadou explained in a phone interview on May 4. Asteriadou hopes to shatter these misconceptions through her work as a music educator. 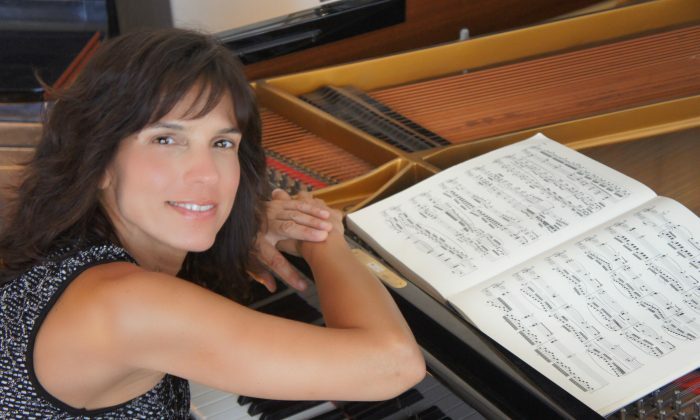 She currently teaches at Kutztown University in Pennsylvania and the Manhattan School of Music, Precollege Division, where she received her doctorate. A graduate also of the Juilliard School, Asteriadou is an acclaimed soloist and chamber musician, who has appeared in recitals in major concert halls in the United States, South America, Canada, and Europe. She has performed with orchestras such as the Moscow Radio Symphony, Academy of Saint Martin in the Fields, Orpheus Chamber Orchestra, and Stuttgart Kamerata to name a few. A native of Greece, she has recorded for the BIS label a wide variety of works, including some by Greek composers. Asteriadou acknowledges that convincing people, especially adolescents, to consider classical music to be rewarding can be challenging. During one of her outreach visits to a local high school, she performed an experiment. By using two versions one after another, she introduced the famous song “Der Erlkönig” by Romantic composer Franz Schubert. Schubert’s “Der Erlkönig,” based on a Johann Wolfgang von Goethe poem, is eerie, intense, and ultimately sad. It tells the harrowing journey of a father and his little son on horseback in the dead of night. In a dialogue between the two, the frightened boy says he sees otherworldly figures who talk to him. The boy tells his father that the Elf King wants the boy to come with him. The father tries to comfort the boy by explaining that the boy sees only elements of nature—the fog, rustling leaves, willow branches—and not to worry. By journey’s end, though, the Elf King seemingly takes the boy to his own kingdom, for the child is dead. Originally written for a male singer and piano, Asteriadou first played Franz Liszt’s 19th century transcription of “Der Erlkönig” for solo piano, and then immediately showed the class a video of the rock ‘n’ roll cover by the German thrash metal band Rammstein. Despite the theatrics and high volume of Rammstein’s version, the students preferred the classical, Asteriadou said. It struck them as more authentic, and directly communicated the emotions to them. Classical music, on the other hand, may require more attention from the listener and more time to process. Also, by its very nature, most pop music aims at mass entertainment and speaks only of its own time, while classical music attempts to transmit a philosophical truth, a particular way of seeing the world. Although there may be personal relevance in these larger truths, the themes of classical music tend to be broader and more global and reveal “the suffering of humanity rather than the suffering of an individual,” she said. Asteriadou has seen the satisfying effect of classical music on her own students. She cites examples of two students who have found classical music to be more fulfilling than other pursuits. One student had played in a rock band in high school but turned to classical piano as he grew older. His interest and commitment to classical music deepened over time, with no reason other than the intangible pleasure the music gives him. Similarly, another student began her classical training very late and has had to work much harder than her peers to catch up. “The sincerity of her efforts clearly points to a deep connection to the music,” Asteriadou said. “If you were to ask either one what motivates them to spend so much energy on a pursuit that is neither ‘cool’ nor immediately profitable, both would point to the sense of truth, order, and timeless beauty they connect with when they make music. It is not for tangible reward or excitement, although those things may become byproducts of one’s labors; rather, it is self-expression on a different plateau, which, once reached, it is impossible to turn back,” Asteriadou said. If classical music has the reputation of being stuffy, Asteriadou believes part of the problem is the way it is delivered. The formal, serious tone of the classical concert experience creates in patrons an expectation that they will hear something of the highest quality. But, that expectation may also inspire an unnatural separation between composer, performer, and audience, which is not present at pop concerts. At pop concerts, interaction is expected and fans come out in order to connect to the music even more deeply. In fact, “at most pop concerts, the audience is mainly comprised of fans who know every lyric and melody of the songs which are being performed already, and have downloaded and sung along with every song in the band’s repertoire before even purchasing the tickets to the live show. Not the case for classical concerts,” she said. To remedy this problem, Asteriadou recommends that classical musicians engage their audiences by speaking to them directly. Whether explaining the pieces themselves, their historical contexts, or the artist’s relationship to the work, this communication can personalize the event for an audience. In addition, musicians may imbibe the serious tone of the event, and just as in the case of the audience, they may feel disconnected during a classical performance. The result may be that the musicians may dampen or stiffen their own physical performances. Thus, Asteriadou believes classical musicians can better engage the audience by relaxing into the experience of the music and by using their whole bodies while performing. She does not mean they should add an artificial veneer or create choreography to draw attention away from the listening experience, but simply to allow the full flowering of their own natural physical expression, which organically arises, to help listeners to their own deeper, visceral experience. With deeper engagement between the performer and audience, the inherent complexity and emotional richness of classical music—its ability to satisfy us—will become apparent to a wider audience. Asteriadou is confident that through this feeling of fulfillment, people will change their minds. Through sharing her knowledge and excitement about the music she plays, she dares her listeners not to fall in love with it as well.